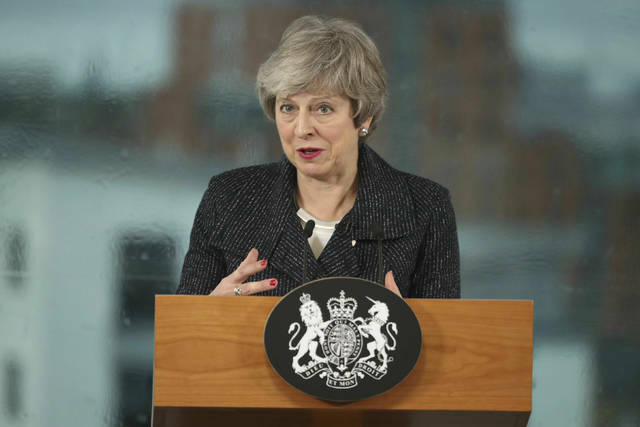 LONDON (AP) — British Prime Minister Theresa May told business leaders in Northern Ireland on Tuesday that she is seeking changes to the U.K.’s withdrawal agreement with the European Union, but not the total removal of the Irish border provision that is the most contentious part of the deal. Seeking to ease fears about the return of customs posts and vehicle checks, May said during a visit to Belfast that the British government is committed to preventing the construction of a physical border between EU member Ireland and the U.K.’s Northern Ireland after Britain leaves the European Union. May’s words of reassurance did little to solve her Brexit border dilemma. Britain is scheduled to leave the EU on March 29, but no withdrawal agreement has been approved because Britain’s Parliament voted down May’s plan last month, in part because of concerns about the border plan, known as the backstop. It is a safeguard mechanism that would keep the U.K. in a customs union with the EU to remove the need for checks along the border until a permanent new trading relationship is in place. The border area was a flashpoint during the decades of conflict that cost 3,700 lives. The free flow of people and goods across the near-invisible border today underpins both the local economy and Northern Ireland’s peace process. But many pro-Brexit British lawmakers fear the backstop will trap Britain in regulatory lockstep with the EU, and say they won’t vote for the EU divorce deal unless it is removed. EU leaders, however, insist the withdrawal agreement the bloc struck with May’s government late last year can’t be reopened. Still, May plans to meet with European Commission President Jean-Claude Juncker and other EU leaders in Brussels on Thursday seeking changes to the backstop, and will return to Parliament next week with — she hopes — a modified plan. 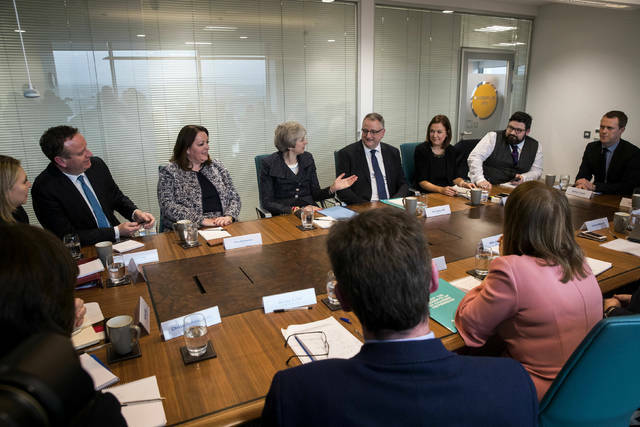 May said Tuesday she is seeking changes to the backstop, rather than its removal from the agreement, as some pro-Brexit British lawmakers want. 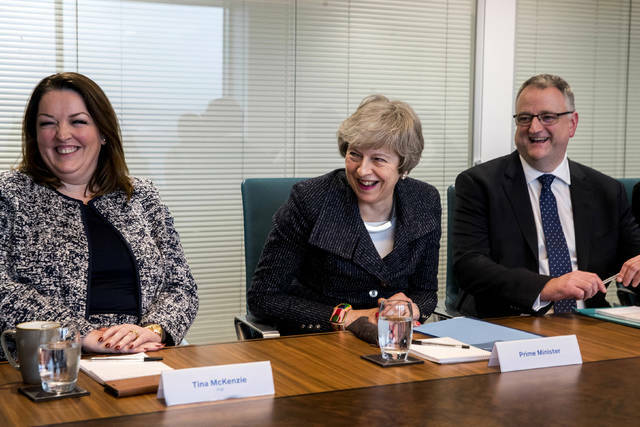 “I’m not proposing to persuade people to accept a deal that doesn’t contain that insurance policy for the future,” she said. The country got a head start on competitors in December 2013 when it became the first in the world to regulate the cannabis market from growing to purchase, a move which has brought a wave of investment. For Uruguayan citizens or legal residents over 18 years old, the law allows the recreational use, personal cultivation, and sale in pharmacies of marijuana through a government-run permit system, and officials later legalized the use and export of medical marijuana to countries where it is legal. No company has yet to begin large-scale export operations, but many say that selling medical cannabis oil beyond the country’s local market of 3.3 million inhabitants is key to staying ahead of the tide and transforming Uruguay into a medical cannabis leader along with the Netherlands, Canada and Israel. “The Latin American market is poorly supplied and is growing,” said Chuck Smith, chief operating officer of Denver, Colorado-based Dixie Brands, which recently formed a partnership with Khiron Life Sciences, a Toronto company that has agreed to acquire Dormul SA, which owns the first license issued in Uruguay to produce medical cannabis. Uruguay is taking a leadership position in growing high CBD, high value hemp products. So we see that as a great opportunity from a supply chain perspective,” he said, referring to the non-psychoactive cannabidiols that are used in medical products. Fotmer’s 35,000 marijuana plants are sheltered in 18 large greenhouses measuring 12.5 meters by 100 meters (41 feet by 328 feet), where workers such as Morales change into special clothing, wash their hands with alcohol and wear gloves and surgical masks to avoid any contamination. Competition is arriving as well. In December, Uruguayan President Tabare Vazquez inaugurated a $12 million laboratory owned by Canada’s International Cannabis Corporation, which aims to produce and export medicine from hemp, a variety of cannabis that contains CBDs but has no psychoactive effects. Diego Olivera, head of Uruguay’s National Drug Secretariat, said Uruguay’s comprehensive cannabis law, along with its strong rule of law and transparent institutions, gives it an head start. Associated Press writers Luis Andres Henao in Buenos Aires contributed to this report.